When mystery writer David Rosenfelt and his family moved from Southern California to Maine, he thought he had prepared for everything. They had mapped the route, brought three GPSs for backup, as well as refrigerators full of food, and stoves and microwaves on which to cook them. But traveling with twenty-five dogs turned out to be a bigger ordeal than he anticipated, despite the RVs, the extra kibble, volunteers (including a few readers), and camping equipment. 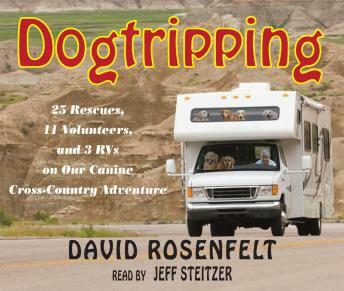 Rosenfelt recounts the adventure of moving his animal companions across the United States with humor and warmth, and tells the tale of how he and his wife became passionate foster parents for rescue dogs, culminating in the creation of the Tara Foundation and successfully placing several thousand dogs with loving families. We have read many of Rosenfelt's mysteries which are very good, but this is our favorite! It is the story of his family and their dog rescue operation. They decide to move all the way across the country with their 25 rescued dogs. A fascinating story of how they acquired helpers and how they managed the move. It is both interesting and hysterical!